The Canal Music Fest is an annual, family-friendly, FREE concert held at City Park. The event has come a long way over the past nine years—from roughly 150 in attendance in 2010—to nearly 4,000 people at our recent events! Mark your calendars for the second Saturday in June—and don't miss this fun-filled evening of music, food and friends! On June 8, 2019—we will celebrate our 10th Anniversary and present two awesome bands! We are excited to welcome "Dogs of Society—The Ultimate Elton Rock Tribute" and local favorite "Stranger–featuring Zack Nelson" to the 2019 Canal Music Fest! Dogs of Society, featuring the "spot-on" vocals of John Gore, delivers an all-live, '70s-style rock concert faithful to the spirit of the classic, early Elton John recordings, including smash hits like Bennie and the Jets, Tiny Dancer, Crocodile Rock to deeper cuts like Funeral for a Friend, Madman Across the Water and All the Girls Love Alice. The band has rocked crowds at arenas, large outdoor shows, city-wide celebrations, tribute series and national fundraisers. And Stranger is certainly no stranger to anyone in the area. We are thrilled to host our favorite '80s tribute band to help us celebrate the 10th Anniversary of the Canal Music Fest! Where we've been. . . The Canal Music Fest began in 2010 and was held at the Canal Lock Park (thus, the name) and featured the “Voo Doo Puppets” and "Leadfoot Johnny"—two blues bands from Cincinnati. In 2011, the event moved to City Park and hosted local favorite, “Ticket to Ride”, a Beatles tribute band, as well as a "beer garden". In 2012, we moved again—from the front of the park to the rear of the park, adjacent to the river, and hosted the popular Jimmy Buffet tribute band, “Parrots of the Caribbean”. Our food and beverage selection increased and so did our attendance! The 2013 event, featuring local talent the "Broken Lights" and headliner "Phil Dirt and the Dozers" played to a crowd of over 2000 people. In 2014, we brought in Canadian band “Hotel California”, and for the first time, hosted our presenting sponsors in a VIP area. In 2014, we clicked in roughly 3,000 people! We hosted "Almost Queen" at our 2015 event and despite a little rain early on—we had nearly 3,500 people in attendance! In 2016, we were entertained by "Absolute Journey Tribute" and had our largest turnout to date—with nearly 4,000 in attendance. We followed up in 2017 with an awesome performance by "Satisfaction—The International Rolling Stones Show". In 2018, we were thrilled to present "Tusk—The Ultimate Fleetwood Mac Tribute and despite a stormy start, the show did go on and was phenomenal! What an awesome event this has turned out to be. And we are looking forward. 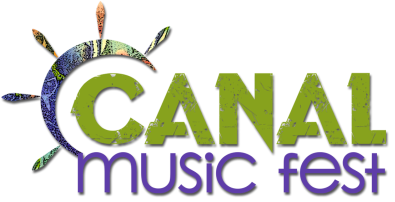 ​Visit the Canal Music Fest website for additional information and directions to this year’s event—plus check out photos and videos from previous years' events. Follow the Canal Music Fest for the latest news and updates!